Faith based organisations around the world are at the forefront of community-led development momentum, including here in Aotearoa. Community-led development resonates because it helps to expand established practices of ‘pastoral care’ to include a broader spectrum of tools that can naturally nurture the heart and soul of the community, writes IC’s Denise Bijoux. Many such organisations and groups have, of course, worked with their communities towards better lives for many years but there is a conscious returning to ancient roots where being hands on champions of social justice and peace making is once again at the heart. 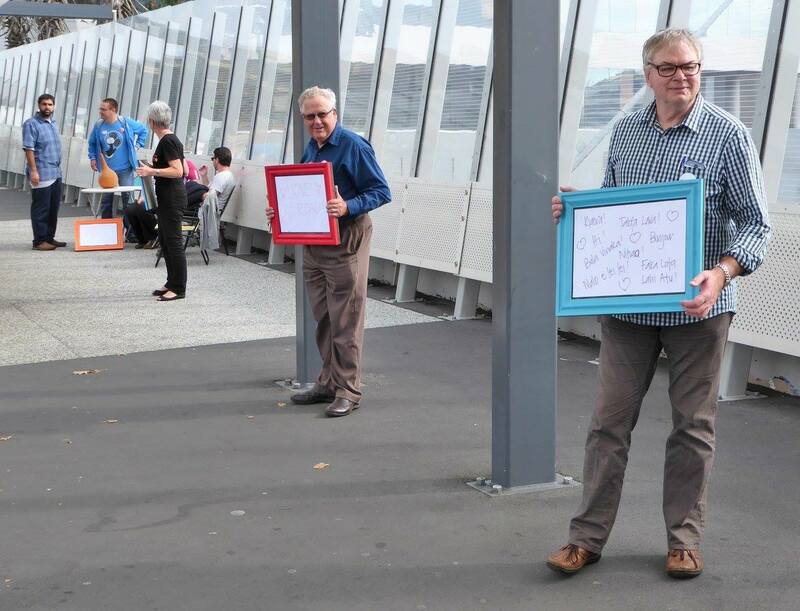 During his recent visit to New Zealand Jim Diers and I ran three workshops co-hosted with faith organisations. We shared and practiced key concepts and tools for community building and community action and together, we worked out some integral roles faith communities can take in growing local community beyond their church communities. It’s about being in and of service to those around us, much more than it is about providing services. This means working with the priorities and energies of our neighbours and local communities, and at their pace too. 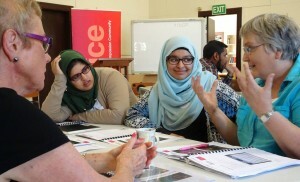 Two of these workshops were in Auckland, and one in Dunedin. Here’s some insights from three Auckland participants. The Courage workshop in Auckland was co-hosted by John MacDonald, Superintendent at Methodist Mission Northern, and a leader of Splice – a movement of people connecting in Auckland’s City Centre. Splice happened when, in 2012, two inner city church communities decided to re-focus their mission in Auckland’s central business district. 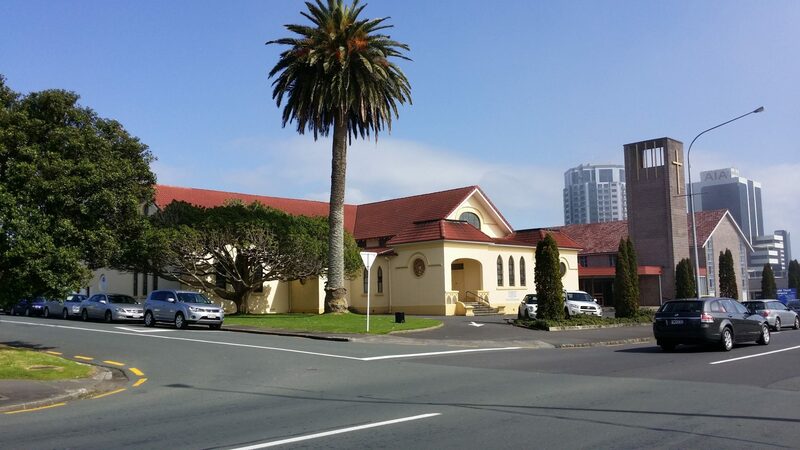 Acting together, the congregations of the Aotea Methodist Chapel and St James Presbyterian Church agreed to support a new role. Other partners also joined the evolving enterprise: the Auckland Methodist Synod, the Northern Presbytery of the Presbyterian Church, and Methodist Mission Northern, which also provides project oversight. Already that way things were being done was different. John was hired as the chaplain at large and spent the first couple of months immersed in the city to get to know the people. By listening to and working with many people, Splice has evolved and works in ways that are well beyond traditional church practices of pastoral care. At times this challenges the “religious status quo” and demands closer relationships and better understandings among community builders of all kinds. John saw the Courage workshop as not only a way of bringing diverse people together (different faiths, business people, artists, activists, community development workers and more) – and therefore being a tool to grow interconnection beyond the host church and faith organisations in and of itself – but also as a way of sharing and acting together using tools new to many of the participants. “Courage showed us that we are not as far apart as we might think we are. That with some courage, communication and innovative techniques, we can find many common goals across our very diverse neighbours here on Karangahape Road and by knowing this we can be a better neighbour ourselves; we can grow community in ways that work for us all who are here in this place right now. This will help sustain what is valued here and grow the things we want more of. Aarif Rasheed is a NZ-born Fijian Muslim. He is a community lawyer, mediator and facilitator who set up JustCommunity. 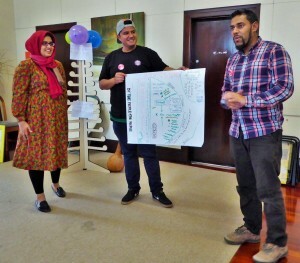 He attended the Courage workshop so he could “make more sense of how” his work creating meaningful connections and conversations between diverse faith communities could be enhanced in a way that allows people to self-advocate. “Minority communities are often the most disillusioned with their leadership because of the frequency of leaders being compromised across the diversity of often conflicting interests”, he says, “This disconnection with leadership further reduces the already minimal engagement minority communities are able to have with the wider community. CLD allows us to give unheard people in the politics of diversity a real and empowered voice which requires a truly bottom up approach”. In this context, CLD is as much political as it is practical. Courage and new techniques are both required, and the impact of the workshop is already having a far reaching impact. “My current work presently seeks to employ CLD methods to impart the richness of religious and cultural tradition and wisdom in the current disconnected individualist environment that has developed a phobia for tradition out of for example Islam’s identity crisis. In doing so I also connect leaders from more mature diverse communities like Sydney and South Africa. CLD will allow me to take the accumulation of these connections and conversations back to local communities to decide their own needs, in accordance with their complex geo-political identities, to join who they want, how they want, and to what end. The opportunities are limitless! I look forward to introducing more people to not just the concept but the techniques of CLD, to make these words a reality in the coming 5-10 years”. Also looking to make CLD a reality in both process and outcome is another Courage workshop participant, Reverend Peter Norman. He is Superintendent at the Northcote Takapuna Methodist Parish and also hosted a shorter workshop with Jim and I after the Courage event. Peter agrees that developing strong, resilient and active communities can come, in part, from a recognition that faith based groups can have key roles to play in community led development. Faith groups can have access to assets, talents and resources the wider community may not have and by activating these in ways that are in service to the visions of local people, faith groups can contribute to deeper community connections, cohesion and capital. “The growing diversity and constantly changing demographic has highlighted the need to move away from insular thinking and break down the four walls. 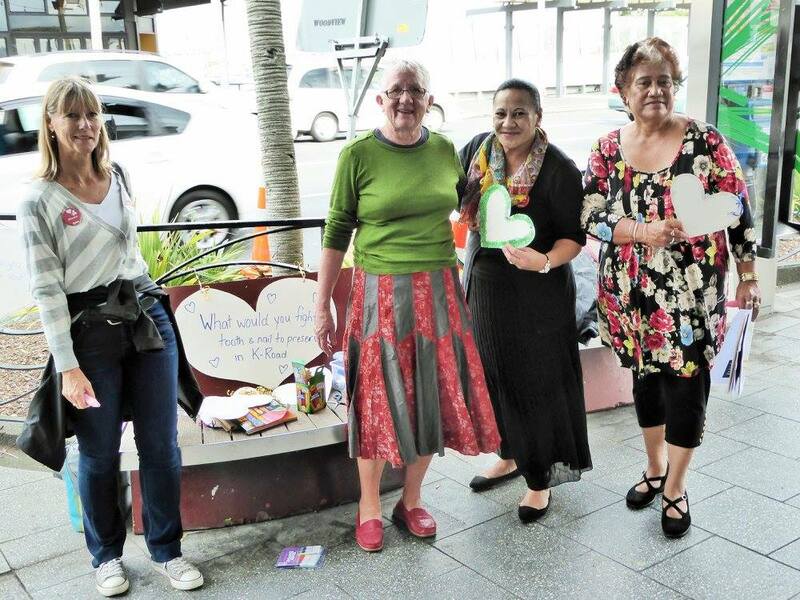 For Takapuna Methodist Church this has meant reassessing our raison d’etre. Out of this reassessment came a vision for Compassionate, Creative, Connected Communities and a desire to find meaning and purpose in working with and for others. However, in order to do this a deeper more meaningful engagement with the community was required. One of the things we have done to achieve this is form a partnership with Auckland North Community and Development and Lifewise. This ‘Shore to Thrive’ project has employed a Community Development Coordinator and has also spurred us to create ‘Community Matters’, a group to help us develop our community focus. Peter is based at the Takapuna Methodist Church which has a long history in community development and was where Neighbours Day Aotearoa began. 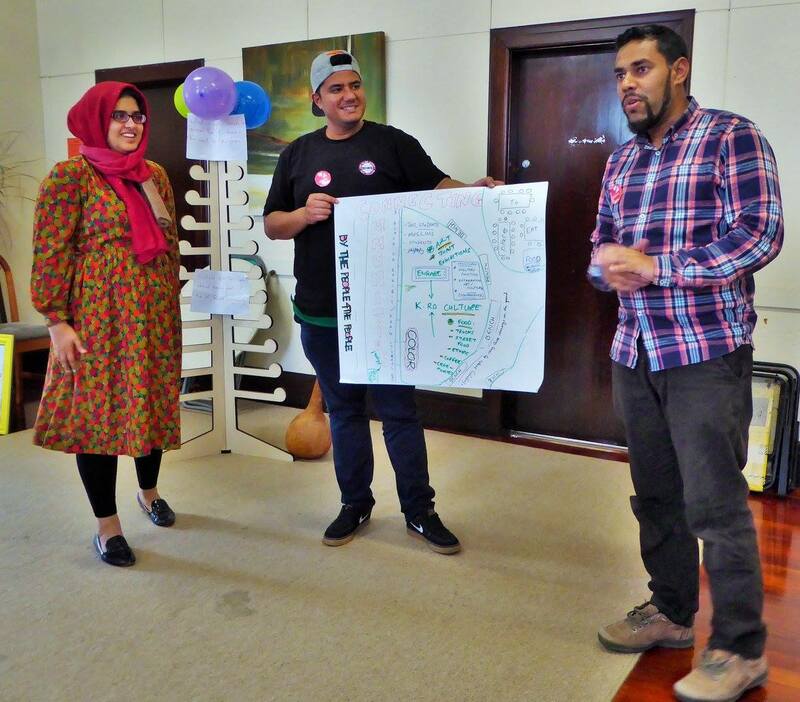 Just a few weeks after the workshops with us, they are incorporating new strategies in both their long and shorter term planning; Working with what they have already have and starting with a welcoming entranceway. What a great place to begin!